Mary Alice (Taylor) Allen – age 91, of Lake City, Tennessee, was gently called home Wednesday morning, July 18, 2018. Born February 19th, 1927 in Briceville, Tennessee from parents Willie “Cleo” Hill and Roy Lee Taylor. 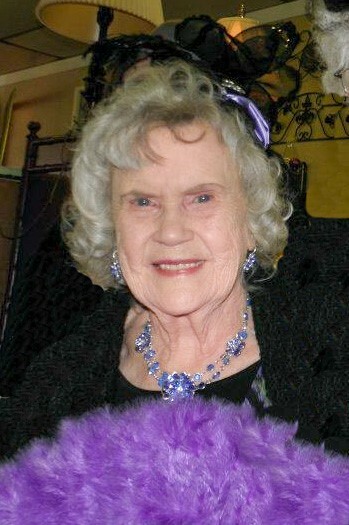 She was the 2nd eldest child from a coal-miner’s family of 10 and baptized early in life at Briceville 1st Baptist Church and graduated Lake City High School in 1945. In her 91 years, she saw Coal Creek become Lake City in 1936 and then turn into Rocky Top in 2014. She married William “Bill” R. Allen, a respected WWII veteran, coal-miner and former Lake City Mayor, in 1948 on December 23rd and had 3 wonderful children, daughter Nancy Allen Thrasher, of Lake City, son Terry Lynn Allen “T.A.” of Lake City and daughter Vickie Allen Markus, wife of Jimmy Markus of Los Angeles, California. In addition to her parents, Mary is preceded in death by her daughter, Nancy in 2013, infant sister Mildred, brothers Johnnie, Norris, Mack and J.E. Taylor. She is survived by her brothers Herman Taylor and Marian Walt “Tade” Taylor with wife Roni of Lake City, sisters Dossie “Dot” Naomi Taylor of Clinton and Nannie Faye Shetterly with husband Ray of Maryland and Sister-in-Law Gladys “Shorty”, wife to J.E. Fondly named "Gran Gran" by her first grandchild Travis, she was a proud grandmother/great grandmother to the following families: Granchildren Travis Dale Thrasher of Lake City (wife Yasha); Terry Lynn Allen, Jr, Patricia Marie Allen of Clinton; Grandson Benjamin “Benjo” Buddy Markus of Nashville; Great-Grandchildren Thyshad “Shad” Korleone Thrasher, Tionné Thniaya Thrasher and Tyus Antrell Thrasher of Lake City. She was also a dear and highly revered Aunt and Great-Aunt to all of her brothers’ and sisters’ children and grandchildren and adored each and every one as if they were her own children. She loved travelling and visiting her relatives in Maryland and her trips to see her daughter Vickie and family in California. Mary had a deep love for her church family as well, and there was not a person who didn’t know it with her entire life’s devotion to the Lord. Her favorite day was Sunday and she was a Sunday School teacher for many years, where she touched many people’s hearts with her kindness, compassion and sharing of the Lord’s word. She loved to sing Gospel hymns and knew them all by heart as she sang in the choir as well. Scores of Lake City’s middle-aged adults remember her as the 2nd grade teacher’s aide in Briceville, where her gentle way of encouraging children to keep trying their best resulted in a life’s lesson of how to be diligent. Special thanks to her loving caregivers Thelma Logsdon, Olivia Ledbetter, Tionné Thrasher, Abby Oaks and Tade & Roni Taylor. Funeral services will take place at Main Street Baptist Church, Lake City, on Sunday, July 22nd, 2018 with visitation from 2:00pm – 4:00pm, followed by a celebration of Mary’s life at 4:00 pm. Pastor Wayne Phillips will officiate. Family and friends are invited to join the family for an old-fashioned Gospel singing at graveside at Leach Cemetery, Clear Branch, TN on Monday, July 23rd at 10:00am. In lieu of flowers, the family wishes for donations to be made to Main Street Baptist Church Building Fund, P.O. Box 405, Lake City, TN 37769.